Whew! This week flew by. I had an eventful work week and I was really looking forward to the weekend! This week the love list is longer because so many things caught my attention. I don’t love this home, but I can appreciate some of the interesting furniture pieces and the black kitchen (I am writing an ode to black post soon). I mean check out the floating burl wood console outside the office. Love! See the entire house tour here. Make sure to check out the custom dining table when you click the link. Let’s just say, it’s a yes! We did a walkthrough of a new project and came across this insane marble in one of the bathrooms. It was so unexpected and the colors are amazing. It could definitely be used today for the right space. I discovered Gordon Shadrach via Aphrochic’s instagram and I fell in love. His work is reminiscent of Kehinde Wiley, but it has a moodier vibe. I also can’t get enough of the antique frames. It takes his work to the next level. I pinned a picture (the first picture below) of Sade recently and then a bunch of Sade images showed up on my feed. I ended up falling into an internet wormhole of Sade pictures, videos, and music. She’s so beautiful and talented! I’ve been into Lion Babe since I heard Treat Me Like Fire and their album and collab with Childish Gambino sealed the deal. They’ve released new music recently and I am really feeling Get Into the Party Life. Check it out below. 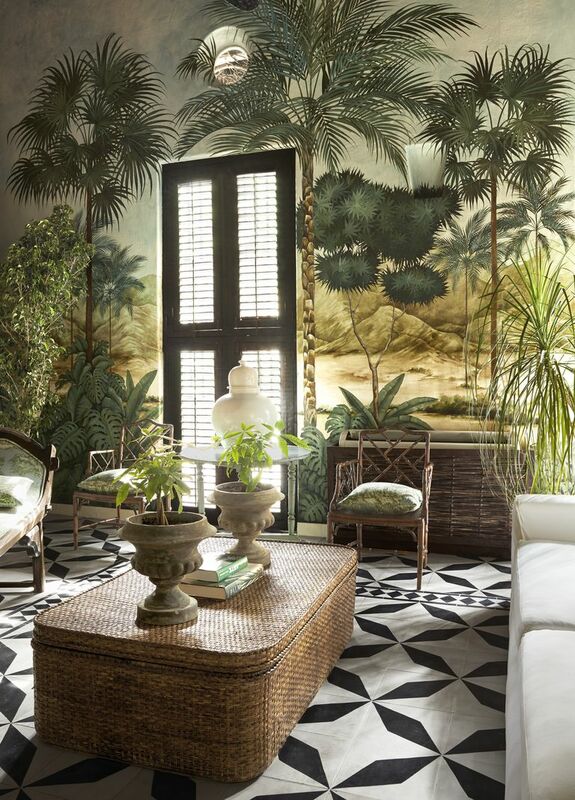 This 16th Century Colonial Spanish Villa ,owned by fashion designer Johanna Ortiz, is a Cartagena, Colombia beauty. I love the entry, the floors, and the salon. The salon features a stunning hand-painted mural by an artist ,Eloin Riviera, from Cali, Colombia. Whenever I purchase a house, I want a sunroom so that I can design a similar room. I may not be able to hire a muralist, but there are plenty of mural wallpapers available. I’m kinda obsessed with wall hangings right now. We installed a CC Tapis tapestry at a hotel project for work and it is beautiful. Since then I’ve a found a few other wall hangings. See I told you I had a lot of loves this week. Tell me what you are loving in the comments!